Guests from more than 35 countries gathered in the sunshine in The Hague for the 9th International Society for Neonatal Screening (ISNS) conference. Highlights included fascinating contributions from the sons of screening pioneers Maxwell Wilson and Gunnar Jungner. 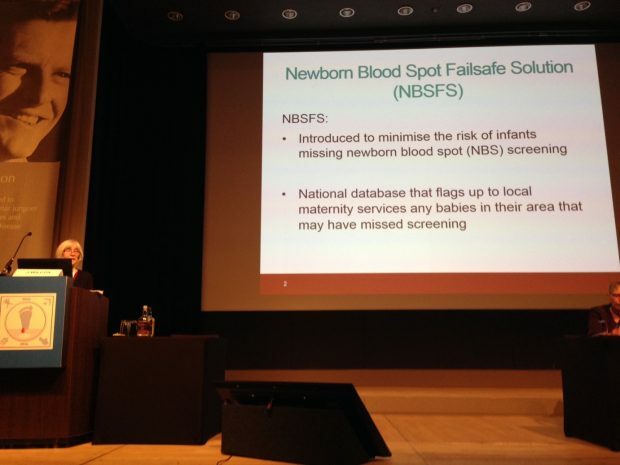 Presentations from UK screening colleagues included Public Health England's Julie Wilcox, the NHS Newborn Blood Spot (NBS) Screening Programme’s Failsafe Project Lead. The whole of the opening session of the conference was dedicated to the history of Dr Wilson and Dr Jungner. In 1968, they published their classic paper on the principles and practices of screening for disease, in which they proposed 10 criteria for appraising screening programmes. The 20 criteria currently used by the UK National Screening Committee are based on their original suggestions. It was extremely uplifting to hear the history of the Wilson and Jungner principles and practices of screening for disease from each man’s son. Julie Wilcox updated delegates on the benefits and challenges of introducing the Newborn Blood Spot Failsafe Solution in England. Other presentations included an evaluation of the newborn sickle cell screening programme in England (2010-2014) and the diagnostic challenges associated with screening newborns for cystic fibrosis. The NBS programme would like to thank the organisers for such a successful and innovative meeting and the chance to share important knowledge on screening globally. See the conference website for more information on the event and to download the presentations. Blood spot quality is getting better – and more can be done!